Vito John Fossella Jr. (born March 9, 1965) is an American Republican politician from the state of New York who formerly represented the state's 13th Congressional district in the U.S. House of Representatives for six terms, from 1997 to 2009 serving as the lone Republican from New York City. Fossella, a Staten Island native, was born to a family that included several politicians. Fossella initially took office in 1997, after winning a special election held to replace the resigning Susan Molinari. As a result of a DUI arrest in Alexandria, Virginia, on May 1, 2008, followed by the public disclosure a week later that he had had an affair with Laura Fay, a retired US Air Force lieutenant colonel, that had resulted in a three-year-old child while Fossella was married, he announced on his official website on May 20 that he had chosen to serve out the remainder of his term, which ended on January 3, 2009, but decided not to run for re-election. Fossella was born on Staten Island into a Roman Catholic family of Irish and Italian descent. Fossella's great-grandfather James A. O'Leary represented Staten Island in Congress from 1935 to 1944. One of his uncles, Frank Fossella, was a prominent Staten Island Democrat who was a City Council member for four years, ending in 1985. His father, Vito John Fossella Sr., served in various appointed positions in the city administrations of Democratic Mayors Edward I. Koch and Abraham D. Beame, then became a successful construction engineer. Fossella, the fourth of seven children, was a basketball player at Monsignor Farrell High School, where he got his first political experience in the student council. He briefly played violin and percussion with the Christian pop band Sonseed. He attended Iona College in New Rochelle, then transferred to the Wharton School of the University of Pennsylvania, where he received a Bachelor of Science degree in economics in 1987. At Penn, he was a member of the Sigma Phi Epsilon fraternity. After college, Fossella worked as a management consultant at the accounting firm Deloitte & Touche. Deloitte Touche Tohmatsu was the second largest campaign contributor to Fossella in the 2006 campaign cycle and among the largest contributors in the 2008 campaign cycle. Fossella then attended law school. He received a Juris Doctor from the Fordham University School of Law in 1993, and worked as an associate at a medical malpractice defense law firm Schiavetti Begos & Nicholson. In 1990, Fossella married Mary Patricia Rowan. They have three children and live in the Great Kills neighborhood on Staten Island. Fossella also had a daughter out-of-wedlock in 2005 with retired Lt. Col. Laura Fay. Fossella was a political protégé of Michael J. Petrides, a member of the city's School Board and a Staten Island political strategist. In 1990, Fossella changed his voter registration from the Democratic Party to become the family's first Republican. "I found myself voting more and more for Republicans," he said in 1997. "For the most part, my family reacted well. But still, I would love to have been a fly on the wall." Under Petrides' guidance, he joined the 1992 re-election campaign of Staten Island Congresswoman Susan Molinari and, in 1993, the mayoral campaign of Rudy Giuliani. Fossella's political career began in April 1994, when he won a special election to the New York City Council, representing Staten Island's South Shore and Mid-Island section. He replaced Councilman Alfred C. Cerullo 3d, who had left to become Commissioner of Consumer Affairs in the Rudy Giuliani administration. Fossella spent $92,000 in the election, in which he had five opponents. In November 1994, Fossella was reelected to the remaining three years of Cerullo's term, defeating Democrat Rosemarie Mangano. He served on the Council until November 1997. Securing funding for the construction of P.S. 56 and P.S. 6, the first new schools to be built on Staten Island in over a decade. Fossella in Lower Manhattan on September 12, 2001. In June 1997, Fossella was selected by executive committee of the Staten Island Republican Party as its candidate to run for the Congressional seat being vacated by Representative Susan Molinari. Fossella won the special election in November 1997, defeating Democratic Assemblyman Eric Vitaliano with 61 percent of the vote. 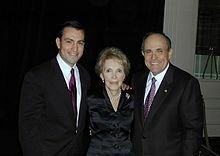 Vito Fossella, Nancy Reagan, and Rudy Giuliani in 2002. In November 1998, Fossella won a full term with 68 percent of the vote. He was re-elected in 2000, winning 65 percent of the vote against Democrat Katina M. Johnstone even as Al Gore carried the district. In 2002, he was re-elected with 70 percent of the vote, defeating Democrat Arne M. Mattsson. Fossella with President George W. Bush and Peter King in 2004. In 2004, Fossella faced his first close contest against former state assemblyman and judge Frank Barbaro. Barbaro actually won the Brooklyn portion of the district by seven points, the first time Fossella had not won that area; Barbaro had represented much of this area in Albany for 23 years. However, Barbaro performed poorly on Staten Island, and Fossella won there by 26 points—enough for him to win a fourth full term with 59% of the vote districtwide. Some have speculated that he was helped by George W. Bush's 13-point win on Staten Island. Fossella was considered a possible challenger to Mayor Michael Bloomberg in the 2005 election, but he chose not to make the race. In 2006, incumbent Fossella defeated Democrat Steve Harrison, a relatively unknown Brooklyn attorney, by a margin of 56.7%-43.3%. Hillary Clinton and Eliot Spitzer carried the 13th by overwhelming margins. Before Fossella announced that he would not run in 2008, he was included in the National Republican Congressional Committee's list of Republican candidates who qualified for fundraising help because they were thought to be particularly vulnerable. Steve Harrison hoped to run against Fossella again in the 2008 election, but New York City Council member Domenic Recchia also began seeking the Democratic nomination. 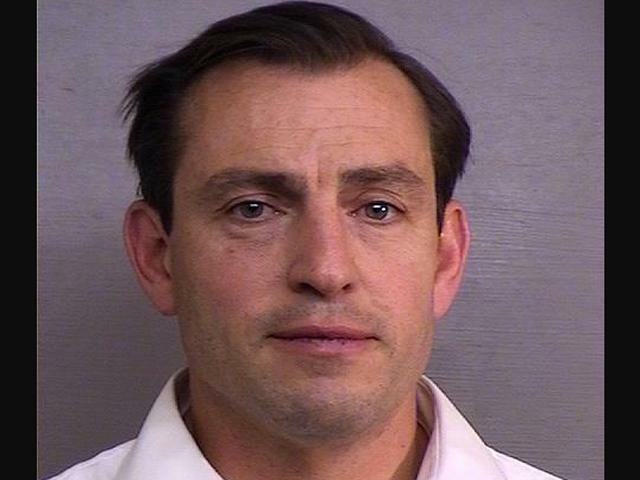 For several days after his DWI arrest and his admission of an adulterous affair and fathering an out-of-wedlock child, Fossella gave indications that he might run for re-election despite these problems. On May 20, however, he dropped out of the race. On May 28, the Staten Island Democratic Party endorsed City Councilman Michael E. McMahon for the Democratic nomination, although Harrison said he would remain a candidate in the Democratic primary. On the Republican side, several prominent elected officials considered running but decided against it. On May 29, the Staten Island Republican Party endorsed Frank Powers, a member of the board of the Metropolitan Transportation Authority who had never held elective office but who promised to spend $500,000 of his own money on the race. However, Powers died on June 22. Powers's son (Frank M. Powers) was also in the race, running as a Libertarian; however, the Libertarian Party did not endorse him. Robert Straniere was on the ballot for the Republican Party, and Susan Overeem was the Libertarian Party candidate. McMahon won the election on November 4, 2008, and replaced Fossella in Congress on January 3, 2009. Fossella's voting record was very conservative by New York standards. In contrast, most Republicans from New York City (such as Rudy Giuliani, Michael Bloomberg, and Fossella's two predecessors, Guy and Susan Molinari) tend to be fairly moderate. Although Democrats have a 17-point advantage in registered voters, the Democrats in this district tend to be fairly conservative on social issues. Fossella had a lifetime rating of 83 from the American Conservative Union. In ratings measuring 17 key legislative votes of the 2005-2006 term of the 109th Congress, issued by Public Citizen, he was the only congressional representative from NY (Senate or House), out of 31 total and 9 Republicans, to score a perfect 0. However, after years of getting ratings in the 90s from the ACU, some of Fossella's voting record shifted more toward the center. He got a 75 in 2006, a 70 in 2007 and a 74 in 2008. In August 2002, appearing on CNN's Crossfire, Fossella argued for partly privatizing Social Security and allow some of the funds be placed on Wall Street investments. He said "I happen to think the President is on the right side of history here. And I think the more you empower American people, the more you give them the opportunity to invest on their own and being in control of their own destiny and their own retirement, the better off we'll be." In a standardized constituent letter in February 2005, Fossella said "We need to examine the viability of voluntary personal savings accounts in which young people would have the opportunity to invest a small portion of their savings." In June 2003, Fossella wrote an op-ed for the Washington Times, in which he said "The claims that progress is too slow, the situation unstable and the United States lacks the expertise to get the job done does not reflect reality on the ground in Baghdad, Kirkuk and beyond. Indeed, the critics who complain that the seeds of democracy will not take root in the sands of a desert where tyranny ruled are as wrong today as the pessimists were in 1945." The final sentence of the column was "The United States will fulfill its commitment to Iraq, and then we will depart, having liberated a nation, freed a people and established a democracy of the people, by the people and for the people." In August 2006, Fossella said that leaving Iraq now would "do a disservice to the noble sacrifice that the troops have made on behalf of our national security." Fossella voted for the Marriage Protection Act in 2004, and for the Federal Marriage Amendment in 2004 and 2006, all of which would nationally define marriage as between a man and a woman. In 2007, Fossella voted for the Employment Non-Discrimination Act, a bill nationally prohibiting job discrimination based on sexual orientation. In 2005, Fossella spoke out against the Bush Administration's handling of appropriating Homeland Security funds. After the 2007 State of the Union Address, Fossella crossed the aisle to join with Senator Hillary Clinton in 2007 to raise awareness of health issues suffered those who at worked at the World Trade Center site on and after 9/11. Fossella is quoted as saying "We have made progress over the last year to begin getting the resources necessary to help our 9/11 heroes. However, we now need a significant investment by the federal government into health monitoring and treatment for those who are sick or injured. In addition, the federal government must develop a comprehensive plan to address the health impacts of 9/11. We continue urging the White House to provide adequate funding in the 2008 budget to help all those who are sick or injured as a result of the terror attacks." Return over $700 million to individual investors by eliminating fees by the SEC with the Investor and Capital Markets Fee Relief Act. () The Act was signed into law by President Bush on January 16, 2002. Help repair the 86th Street subway station in the Bay Ridge area of Brooklyn. This station serves as a transfer point where passengers connect to bus service to Staten Island over the Verrazano Bridge. ^ Staten Island's Fossella will not seek re-election, 2008-05-19, retrieved 2008-05-20. ^ a b Barrett, Devlin, NY Congressman Fossella says he won't seek re-election[dead link], 2008-05-20, retrieved 2005-05-20. ^ a b Jonathan P. Hicks, "Republican Is Chosen To Seek Molinari Seat", The New York Times, June 3, 1997. ^ a b c d Jonathan P. Hicks, "Man in The News — Vito John Fossella Jr.; City Hall To Capitol", New York Times, November 6, 1997. ^ Vito Fossella: Campaign Finance/Money - Top Donors - Congressman 2006. Archived 2007-11-19 at the Wayback Machine Center for Responsive Politics. ^ Vito Fossella: Campaign Finance/Money - Top Donors - Congressman 2008. Archived 2007-12-12 at the Wayback Machine Center for Responsive Politics. ^ Defrank, Thomas M.; Schapiro, Rich; Jaccarino, Mike (May 4, 2008). "Vito Fossella's mystery woman: Va. lady who sprung him from jail lives nearby". Daily News. New York. ^ Jonathan P. Hicks, "Question Haunts a Candidate: 'Didn't You Just Run? '", New York Times, November 8, 1994. ^ Hicks, Jonathan P. (November 5, 1997). "THE 1997 ELECTIONS: CONGRESS; Republican Wins U.S. House Seat Left by Molinari". The New York Times. Retrieved August 3, 2015. ^ Hicks, Jonathan P.; Sullivan, John (June 22, 2008). "Staten Island G.O.P. Candidate Dies". The New York Times. Retrieved May 27, 2010. ^ "Social Security" (PDF). Cato Institute. Archived from the original (PDF) on 24 March 2009. Retrieved 23 July 2015. ^ "Progress in Iraq" Archived 2006-08-29 at the Wayback Machine, opinion column by Fossella, Washington Times, June 4, 2003. ^ Tom Wrobleski, "Congressional hopeful calls on Bush to begin withdrawal from Iraq: Democratic candidate Harrison says country is less secure from terrorism because of the war", Staten Island Advance, August 23, 2006. ^ "Vito Fossella on Civil Rights". On The Issues. Retrieved 2012-05-27. ^ Press Release, "Archived copy". Archived from the original on 2007-01-10. Retrieved 2007-01-10. CS1 maint: Archived copy as title (link), July 13, 2005. ^ "President Signs Investor & Capital Markets Fee Relief Act". archives.gov. 16 January 2002. Retrieved 23 July 2015.